The R-PLEX Mouse Adiponectin Antibody Set includes a matched capture and detection antibody pair and calibrator for the quick and easy measurement of Adiponectin in biological samples. R-PLEX products leverage MSD’s electrochemiluminescence technology for better sensitivity and a larger dynamic range than traditional ELISAs. R-PLEX matched antibody sets enable the development of singleplex and multiplex immunoassays. Individual assays may be developed using MSD avidin- or streptavidin-coated plates. Custom multiplex assays with any combination of R-PLEX analytes, as well as R-PLEX plus U-PLEX analytes, can be developed on U-PLEX MULTI-SPOT plates. To learn more about the advantages of R-PLEX products click here. 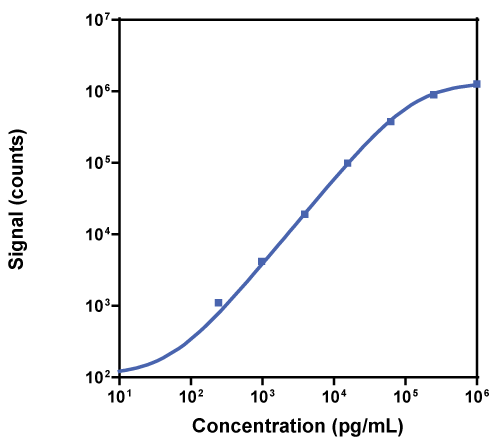 Calibration curve for the R-PLEX Mouse Adiponectin Antibody Set was assessed and representative data are presented below. Description - Adiponectin (ACDC, ADPN, APM1, APM-1, GBP28, ACRP30, ADIPQTL1, ADIPOQ) is secreted exclusively by adipocytes and is thought to play a role in lipid and glucose metabolism. Adiponectin enhances insulin action by activating glucose uptake and fatty acid oxidation. In addition, this adipokine has potent anti-inflammatory and anti-atherosclerotic properties. In contrast to most adipokines, plasma adiponectin is often negatively correlated with body mass index (BMI) in humans and rodents. Impaired leptin gene expression and release in cultured preadipocytes isolated from individuals born with low birth weight. Ozone induces glucose intolerance and systemic metabolic effects in young and aged brown Norway rats.